The first law of holes: if you find yourself in a hole, stop digging. Videos of enforcement officers going around cutting out photos of Dr Mahathir from campaign billboards leaving a gaping hole in its place have gone viral. 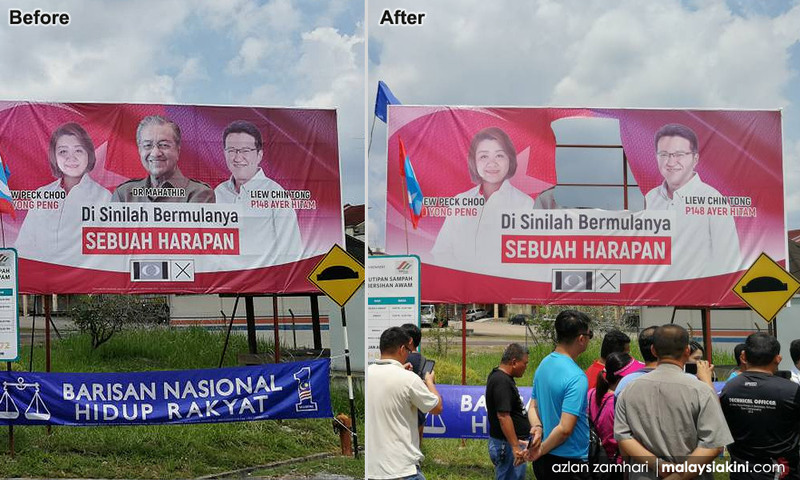 If they think they can remove Mahathir from our hearts and minds by literally cutting him out of campaign posters, they are wrong. All it will do is remind us that there’s a hole in our nation that only Mahathir can fill. Mahathir is now more than just a former prime minister trying to make a comeback; he is an idea whose time has come. Like it or not, he now embodies the change we want and gives expression to the future we long for. He may have been part of the problem before but now, by his actions, he has chosen to be part of the solution and millions of Malaysians love him for it. BN of course talks a lot about its manifesto with the caretaker deputy prime minister even boasting about a surge in support due to the manifesto’s “wow” factor. The BN manifesto runs some 220 pages and contains 14 “thrusts” and 364 initiatives. It promises everything under the sun. Those who can, do; those who can’t, make promises, I suppose. Reading through the various BN manifestos, one is left with the inescapable conclusion that they are out of touch with public sentiment, bereft of imagination, low on ideas and high on desperation. They offer to do what any self-respecting government, particularly one that has been in office for so long, ought to have done a long time ago, and try to make a virtue of it. Promises sound like excuses when one has been in office for a very long time. Instead of, for example, announcing official recognition for the Unified Examination Certificate which Chinese educationists have long campaigned for, they merely promise to recognize it if BN is returned to power. Why hold the Chinese community to ransom this way? If it’s a good thing, recognize it right away. The MCA also promised to safeguard moderation, uphold the Federal Constitution and represent the constitutional rights of Malaysians. How can Malaysians take such a promise seriously coming from a party that supported, promoted and voted for every single piece of repressive legislation in Parliament? In the meantime, the MCA chief, perhaps not wanting to be too closely associated with his boss in UMNO, promotes himself as a close friend of President Xi Jiping of China. If he is hoping that an endorsement from President Xi might improve his dismal ratings among Malaysian Chinese, he is going to be disappointed. Most pathetic of all was the MIC’s manifesto which highlighted fulfilling “the basic needs of the Indian community.” While others are focusing on the digital economy and global connectivity, the MIC is still talking about meeting “basic needs.” If after 60 years of power sharing with UMNO, the basic needs of the Indian community have still not been met, the MIC should simply accept that it has failed, and failed miserably, and just go quietly into the night. In any case, if UMNO and its BN partners really believed that people would buy their promises, they wouldn’t need to go around throwing money in all directions and offering to build roads, bridges, airports, etc. in a desperate bid to gain support. The truth is we don’t need new roads as much as we need a new government. Whatever it is, it is not manifestos that are going to be the deciding factor; anyone who thinks that their manifesto will induce a “wow” factor is simply dreaming. What matters most is the widespread perception that the nation is headed in the wrong direction and that change is urgently needed. Rising costs and growing economic hardship as well as the long years of scandal, corruption, mismanagement, abuse of power and racial and religious exploitation have finally taken a toll. People are tired and weary and long for change. There’s a hole in our nation, a leadership vacuum, a moral bareness, an integrity deficit that all the BN manifestos and promises cannot fill. The first law of holes states that “if you find yourself in a hole, stopping digging.” Digging makes it deeper and therefore harder to get back out. It is a metaphor that means when in an untenable position, it is best to stop carrying on as usual and exacerbating the situation. To continue to support BN is simply to keep digging deeper into that hole and making it even more difficult to get out of the mess we are in. It’s time to look elsewhere for solutions, to give someone else a chance to get us out of the hole we are in. Pakatan Harapan has come a long way. Their spirit has been forged in the struggle for freedom. Their know what it is like to suffer imprisonment, to endure hardship and vilification. They are courageous enough to acknowledge their mistakes and commit to doing better. They’ve learned to give and take, build new bonds of fellowship and trust, found a way to respect differences and build on what unites us. We finally have an alternative that we can be proud of, one that shares our hopes and aspirations for the future. We must give them that chance on polling day or be stuck in a rut for decades to come.